Hannukah is right around the corner, and it’s time to break out the beautiful menorah’s and little candles that will light up the home for eight fun filled nights. Don’t let a few drips of candle wax on the carpet ruin your holiday this year. With this easy way to remove candle wax from carpets you’ll never worry about getting candle wax on your carpets again. Taking care of any stain right away increases your chance of getting the wax out completely, but make sure not to rub the stain in any further. For wax stains on carpets, put some ice in a waterproof bag. Place the ice over the wax, allowing the wax to freeze. Getting water on the wax will make it harder to get out, so make sure no ice is dripping into the carpet. Once the wax is frozen, gently scrape it off the carpet with a knife. Don’t worry about getting out everything, just get out as much as you can without ruining the carpet. Next, spread a clean cloth or paper bag over the remaining wax stain. Use and iron to go over the area, drawing the remaining wax into the cloth or bag. Continue this last step until all the wax is gone. 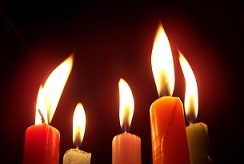 This Hanukkah spend your time opening presents and eating latkes, instead of stressing over a few drips of candle wax.